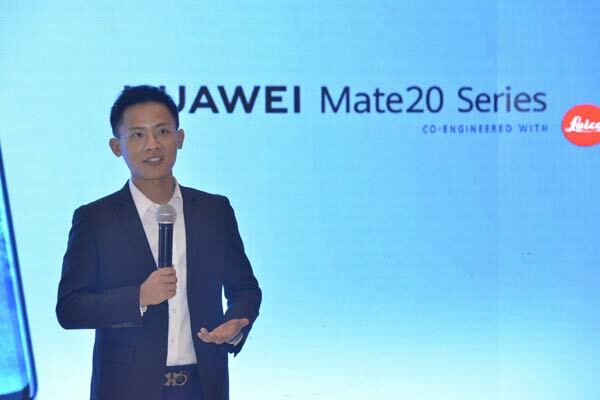 Huawei has launched its new Mate20 smartphone series in Saudi Arabia at a grand ceremony held today (November 8) in capital Riyadh. The new series which comes with EMUI 9, a smart user interface based on the new Android P operating system, is said to be the perfect choice for photography lovers and entrepreneurs. The new series helps users communicate with each other, conduct high-precision tasks, increase productivity, and share what’s on their mind on social networks, as well as delivering the best features for photography lovers because of its advanced camera system, said a statement from the company. Pablo Ning, vice president of Huawei Saudi Arabia, highlighted the success of becoming the second largest smartphone maker in the world. Technical expert Faisal Al Saif demonstrated the advanced features of the Huawei Mate20 series, highlighting their latest technologies. The series also features an AI portrait colour video mode. The new devices using AI can isolate human subjects and desaturate the colours around them to dramatically highlight the person. AI Spotlight Reel identifies clips with a shared theme and auto-generates a montage, made entirely of highlights. The Huawei Mate20 Pro is equipped with a 40MP main camera, a 20MP ultra wide-angle camera, and an 8MP telephoto camera. Together, the trio of lenses supports a wide range of focal lengths enabling it to mimic the results from professional cameras. The model includes a camera feature called HiVision. By simply pointing the camera at an object users can query the internet for more information about it.